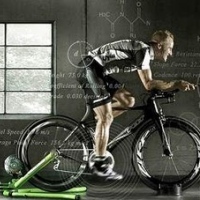 One of the Best Bike Fitting Services in NY! Tulip Bicycle Center & Pro Shop offers all the road, track, triathlon, mountain, kids', and breezer bikes you need. You'll also find a generous selection of equipment like shoes, helmets, bike racks, and apparel. Take advantage of one of the best bike fitting services in NY as Tulip's bike guru will use proven principles of bio-mechanics, anthropometric measurements, and aerodynamics to find a position that's most conducive to your riding style and will ensure your safety. Check the website regularly to keep updated on bike rides in the area. Please call 516-775-7728 to inquire about store hours or if you have any general questions. Or you can send an e-mail to info@tulipbike.com. A Full-Service Bike Shop in three parts of NY! Spokesman Cycles is a full-service bike shop with three convenient locations in NYC. The store carries bikes that fit all sizes, budgets, and overall needs. The inventory includes comfort, mountain, hybrid, professional, folding, tandem, and kids' bikes. You'll also find one of the best selections of cycling accessories in NY, as well as friendly staff and excellent mechanics. Bike rentals are available. New bikes are always arriving at the store. Spokesman Cycles is open daily from 10 A.M. to 7 P.M. The store is easily accessible from Brooklyn, the Bronx, Manhattan, Long Island, and other parts of NY. Check the website regularly for coupons and specials! Biking and other Fun Activities in NY! 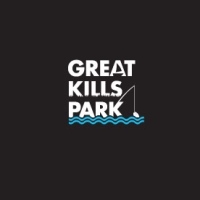 Located on a peninsula in Staten Island, Great Kills Park consists of 580 acres of open space. Visitors can enjoy many outdoor recreational activities, including biking. Bike along the park's paved, multi-use path. Other activities in the area include beaches, bird watching, fishing, boating, rollerblading, swimming, surfing, hiking, and running. If you get hungry at any point in time; the truck vendors outside the park sell hot dogs, burgers, ice cream, chips, sodas, and other items. Nearby attractions include Fort Wadsworth and Miller Field. The park is open 9 A.M. to 4:30 P.M. on Fridays through Mondays. Check the website for directions to the park. An NY Bike Shop run by Avid Cyclists! Broadway Bicycle Company in New York boasts an experienced sales and mechanical staff with a reputation for quality, professionalism, and expertise. In stock you'll find mountain, road, triathlon, and hybrid bikes that fit all budgets; as well as some of the most high-tech accessories. The store carries such brands as Specialized, Redline, Saris, Shimano, Sram, and Hammer/Ecaps. The salespeople are avid riders themselves and don't work on commissions, so they are simply there to serve you. Plus, they're more than happy to share their cycling knowledge and fit you with a bike that suits your body and riding style. Every Saturday the shop holds free workshops to help you better understand your bike. Rides are also held at least once a month and fit every level of biker. 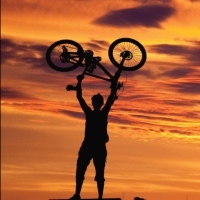 Mountain Biking Rides, Events, and Seminars in NY! Educating the public on the positive aspects of mountain biking and eliminating misconceptions about the sport, The Finger Lakes Mountain Bike Club (FLMBC) provides the state of NY with an invaluable service. The club organizes group rides throughout the southern portion of the Finger Lakes region, catering to riders of all ages and skill levels. The FLMBC can be seen at community events and at bike rodeos for children, teaching them proper bike safety and etiquette skills. The club also hosts seminars on bike maintenance, bike skills, and other outdoor-related topics. A club membership includes subscription to the e-mail newsletter, participation in group rides and events, discounts on cycling merchandise, and the option to join the WOMBATS (Women's Mountain Bike and Tea Society)--a chapter specifically geared towards female cyclists in NY. Downhill & Cross-Country Mountain Biking in NY! 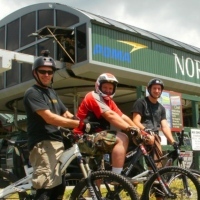 In addition to being one of the best ski resorts in NY, Gore Mountain offers downhill and cross-country mountain biking. Available to both children and adults, you can purchase a single ride or full day admission. Bike rentals are not available on site, but The Gear Source in North Creek is only five minutes away--offering Motobecane 400DS, full-suspension bikes with disc brakes in three sizes. Call 518-251-ADKS for more information. Helmets are required for all rides. The hiking and biking trail map, complete with trail highlights, is provided on the website. All mountain biking tickets include unlimited use of the Northwoods Gondola Skyrides, which allow you to take in stunning views of the Southern Adirondacks! A Great Club for Marathon Cyclists in NY! 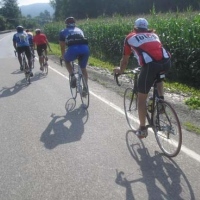 A private organization that promotes ultra-marathon cycling in NY; Adirondack Ultra Cycling organizes rides, races, and other events for all levels of long distance cyclists. The group was founded by John Ceceri, who has 25 years of experience as an ultra-marathon cyclist. If you require overnight lodging during or after one of the cycling events, a list of motels and hotels is provided on the website. If you choose to volunteer for the New York cycling club; you will receive a special T-shirt, food, drinks, and a place to stay during each event you sign up for. To register as a volunteer, contact John by calling him at 518-583-3708 or e-mailing him at john@adkultracycling.com. A Nice Little Bike Shop in NY! Only 2 blocks from Times Square and 3 blocks away from Penn Station is City Bicycles. Get reasonable rates on bikes and accessories from such brands as Bianchi, Dahon, Felt, GT, Haro, Jamis, Mongoose, Redline, and Schwinn. Or you can rent a bike, anywhere from 2 hours to the entire day. Even if you're a biking novice, the staff will be friendly and never talk down to you. Store hours are 9 A.M. to 6:30 P.M. on weekdays, and 10 A.M. to 5 P.M. on Saturdays. Check the website regularly for discounts on bikes and accessories. If you have any questions, call 212-563-3373 or 212-563-3374. You can also send an e-mail to citybicycles@gmail.com. 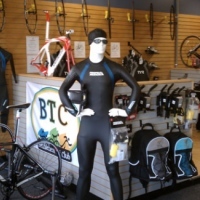 Your Go-to Store for Triathlon Bikes in NY! 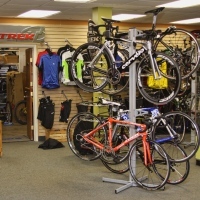 For the largest and best selection of road bikes in NY state, stroll into Syracuse Bicycle! In stock are such beloved brands as Trek, Raleigh, and Giant. An exclusive support shop for the Ironman 70.3, the store also offers triathlon bikes and everything else to fulfill your triathlon needs. You'll even find professionally assembled, high-quality bikes for your kids! The staff is comprised of people of different backgrounds, all of whom have a passion for riding. All the staff members are more than willing to share their vast range of riding knowledge with you as a consumer. Whether you need a derailleur adjustment or a complete overhaul, the store offers super-efficient bike maintenance services. Estimates are always free! Advanced Bikes and Services in NY! Offering quality, brand-name bikes to the state of NY since 1973; Advance Cyclery is a family-oriented shop for riders of all types. The staff is comprised of experienced riders, who keep up to date with the latest cycling education and technology. The inventory includes a lovely selection of recreational, mountain, and racing bikes; as well as exceptional parts and accessories. For every bike you purchase in the shop, you get 120 days of free maintenance. Services include derailleur adjustments, brake adjustments, minor wheel truing, drive train lubes, air pressure checks, and more. If you require bike fitting services, your sales representative will ensure that your saddle height and stem height are set to your liking. Also available are advanced fitting services. A Wide Selection of New Bikes in NY! You'll always find a good selection of bikes at Mad Dog Bicycles. 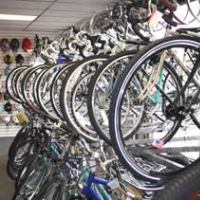 The store offers bicycle sales and service, parts and accessories, tune-ups, and general repairs. The company is an authorized dealer of Jamis and Hampton Cruiser bikes; and carries other popular brands like Surly, We the People, and Redline. Choose from a wide selection of new bikes, including hybrid and comfort bikes. If you don't find the model, size, or color of your choice--the store will typically have it in stock within a few days. During the spring and summer, there's usually a good selection of used bikes. The store is always looking for quality used bikes, so feel free to stop in to trade in your existing bike. 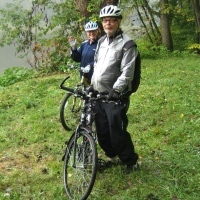 Go Biking with over 100 Fellow Cyclists in NY! If you're searching for great cycling clubs in NY, join the Capital Bicycle Racing Club! 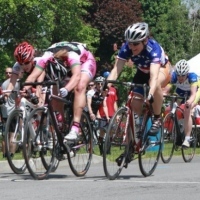 Promoting and developing the sport of bike racing in NY, the club has been in existence for over 25 years and maintains an annual membership of over 100 riders! The members are committed cyclists, who have competed in races in New York, as well as throughout New England and the Mid-Atlantic regions. One of NY's most diverse cycling groups, you'll find members as young as 10 years old and members as old as 80. Member advantages include the ability to race as a team with other CBRC members, club training rides, expert advice from certified coaches and race officials, spin classes during the winter months, social events (i.e. : annual dinners, summer picnics, etc. ), and discounts on equipment and services from local bike retailers. 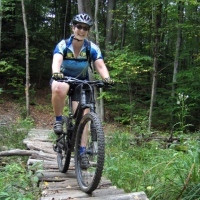 Support Mountain Biking Trails in NY! Founded nearly a decade ago by a small group of dedicated riders, the Saratoga Mountain Biking Association (SMBA) has been striving to preserve trail access and promote mountain bike activism in the NY area. Entirely member-supported, the group boasts nearly 400 riders each year! The organization is dedicated to building and maintaining bike trails in NY, as well as developing good relations with trail user groups in the area. Whether or not you're an experienced mountain biker, the group serves as a great outlet to better your riding skills. If you require any additional information, please send an e-mail to smba@saratogamtb.org. Join SMBA by filling out the membership form online, mailing in your signed forms and payment, or by applying in person at one of four participating shops listed on the website. Bike Rides, Vacation Rides, and Races in NY! 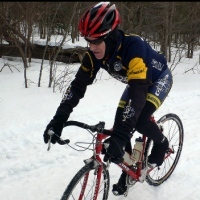 A non-profit organization in NY; the Onandaga Cycling Club (OCC) schedules and conducts bike rides, vacation rides, races, and time trials from March through December. The group welcomes riders of all abilities. Ride descriptions are provided on the OBC website, in case there's a certain ride that doesn't meet your skill level. With safety being a top priority, helmets are required for all rides. Guests are welcome on all bike rides, though it's requested that you join the club after you participate in several rides. The website contains membership forms, a ride schedule, maps of more than 180 rides, and information about signing up for the club's mailing list. Bikes, Accessories, and other Sporting Goods! Serving sports enthusiasts in NY for over 30 years, Steiner's Sports is an independently owned and operated sporting goods company that carries such hot brands as Specialized, Trek, and Thule. The knowledgeable staff will guide you in choosing the best bikes, accessories, and other sporting goods that fit your needs. Choose from a selection of road, mountain, cyclocross, urban/commuter, comfort, cruiser, hybrid, children's, and BMX bikes in stock. You'll also find a nice selection of parts, wheels, tires, tubes, clothing, helmets, shoes, and car racks. In addition to the Glenmont location, Steiner's also has shops in Hudson and Valatie. Enter your e-mail address on the website to keep updated on specials and events. Increase your Fitness and Cycling Efficiency! Buy superb bikes, accessories, and apparel at Elevate Cycles in New York. Featured brands include Bont, Cannondale, Continental, Crank Brothers, Eastern Bikes, FSA, Jagwire, Giant, Shimano, Sram, and others. Take cycling to all new level by taking advantage of one of the store's helpful training sessions. All training programs have been successfully tested by high-level riders and racers. Increase your fitness and cycling efficiency while aboard one of the high-tech, stationary bikes. Learn how to bike (not spin). Visit Elevate Cycles at its Saratoga Springs location or at its other location in Clifton Park, NY. Store hours are 10 A.M. to 6 P.M. on Tuesdays through Fridays, and 10 A.M. to 5 P.M. on Saturdays. Choose from a Wide Spectrum of Bikes! Established in 1982, Freeman's Bridge Sports is a family owned and operated bike shop, dedicated to providing customers with the best service available. The trained staff is always available to answer any questions you have about the sports of cycling and skiing. Browse through an inventory of some of the highest quality bicycles in all of NY. The store carries 10 different cycling brands that cover a wide spectrum of bikes, whether you need a full-out road racer or a children's bike. The service department is run by factory-trained mechanics, who know bicycles inside and out. No repair is too big or small, as the store covers everything from tube replacements to full bike overhauls. Everything you need in an NY Bike Store! 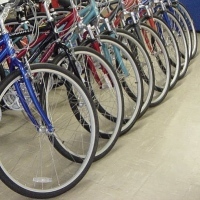 If you're thinking of buying a new bicycle, the Bike Zone features a broad selection of bikes for different people and uses. The staff will provide you with expert assistance in choosing the correct bike type and model. After you choose your bike, the staff will find the right frame size for you and fit it by positioning the seat and handlebars, brake levers, and shifters. If you're still unsure about whether or not to purchase your bike, Bike Zone allows you to test ride any bike in the store! Plus, every new bike comes with a free tune-up! The store is staffed by avid, enthusiastic cyclists who love to share their expertise with you, so questions about cycling are always welcome. Find all Shapes, Styles, and Sizes of Bikes! Handlebars Cycle Company specializes in all styles, shapes, and sizes of bikes. With the store being owned and staffed by experienced cyclists, you can expect some of the greatest customer service around. All the employees are intimately involved in the sport of cycling; actively competing in local, regional, and international races. Purchase bikes and accessories from such major brands as Accelerade, Bell, Bianchi, Blackburn, Castelli, Body Glide, and Elite. If you don't find the brand of your choice, the staff may be able to order it or offer you a worthy alternative. At Handlebars, the employees believe that proper bike fitting is essential to your cycling experience. 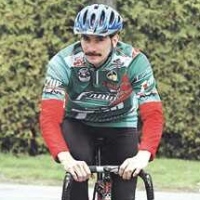 That's why the employees will utilize their decades of experience in helping you get properly fitted for your bicycle. A Full-Service Bike Shop with a Cafe! 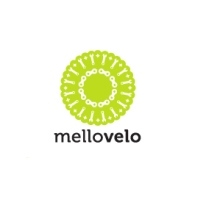 One of the best independently owned bike shops in NY, Mello Velo is an environment where every rider feels welcome, from road racers to commuters. You can depend upon the professionally skilled staff for quick repairs and maintenance service. Browse through a broad selection of stylish accessories and apparel. Buy new bikes from such hot brands as Kona, Bianchi, Civia, Surly, Pake, Soma, and Sun. You can also select from a generous array of used bikes in stock. The full-service bike shop offers reasonably priced bike repair services (with free repair estimates), as well as a variety of custom services like custom wheel builds, frame painting, and fixed gear conversions. The rider owned and operated store even contains a cafe; where you can order coffee, sandwiches, wraps, salads, soups, and other food and beverages!